Tour Description: Meet our private tour guide at the arrival hall of Beijing airport. Drive to the Summer Palace. 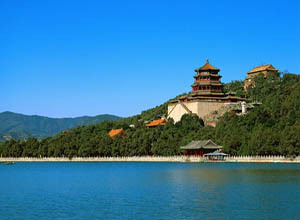 It is a famous imperial garden with beautiful landscape and typical Chinese architecture. Drive back and visit to the Olympic Green to take photos with the novel Bird’s Nest and Water Cube. *Admission fees for all of the sightseeing spots listed in the itinerary. *A private English-speaking tour guide and a private air-conditioning vehicle with professional driver. *Service charge & government taxes. *China life tourist accident/casualty insurance (compulsory insurance by the government. 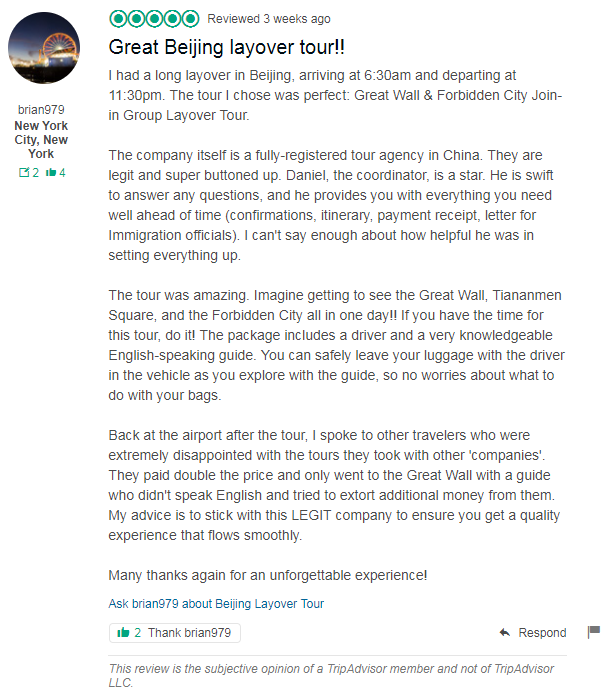 Every legally tour company in Beijing have to buy it for every client). *Gratuities, tips to guides or drivers. 1. We are a legally registered tour company, operating Beijing layover tours since 2012. No one know it better than us, please see our profile here. 2. We will guide you to get Visa-free permit step by step, and make sure you get back to airport in time. We also provide warm coats, wheel chair and baby seat free of charge. 3. Best price guaranteed. If you find a lower price with same service and includes same items and policy as we listed, we will refund you the difference in price. 4. We know that flights delay happens. If the time left is not enough to do the tour. You just inform us 4 hours before the scheduled pick-up time. We will refund you in full. Even if you are not able to get out of airport for some reasons or you want to cancel the tour but did not inform us. We will still cut the guide and driver airport transfer cost and refund you the rest. As we know most companies would not refund anything at all. 5. Some websites just supply an English speaking tour guide drive you for the tour. This is not allowed in China. The vehicles need to be tourism qualification certificate of operating vehicles, not a tour guide’s personal car. Your tour will be ruined if this behavior be founded by officials. We supply a professional driver and a car with licence as well as a professional English speaking licensed tour guide, both of them work for you. We will make sure you can enjoy a safe tour with professional English interpretation both during driving and in attractions, and would not waste your time for parking. Our driver will make sure your luggage is safe while you are not in the car.